August Recap + $100 Magnolia Market Gift Card Giveaway! Another month has flown by and here we are again. It’s time for another Reader Appreciation giveaway! 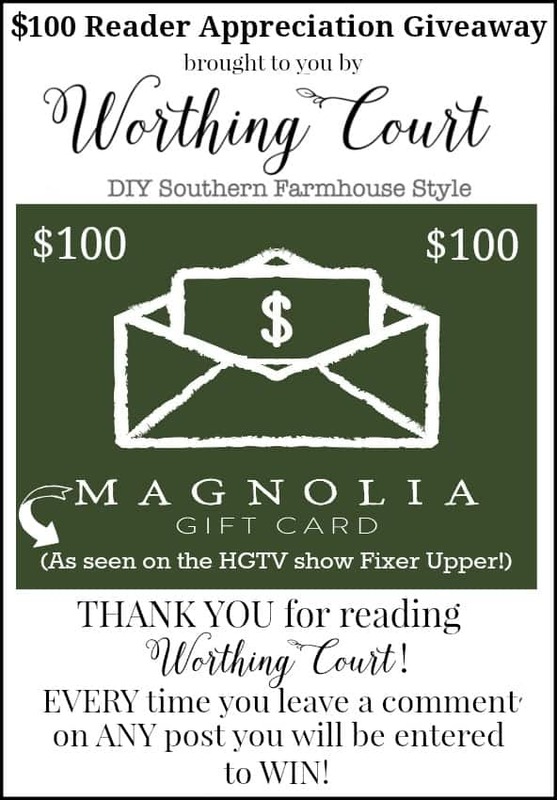 Last month’s giveaway of a Magnolia Market gift card was SO popular, let’s do it again! If you aren’t familiar with Magnolia Market, it’s the store owned by Chip and Joanna Gaines (of the HGTV show Fixer Upper) themselves. Yep, their online store is filled to the brim with all things Fixer Upper. Entry couldn’t be easier – simply leave a comment on ANY post during the month of September and you are automatically entered! More comments = more chances to win! 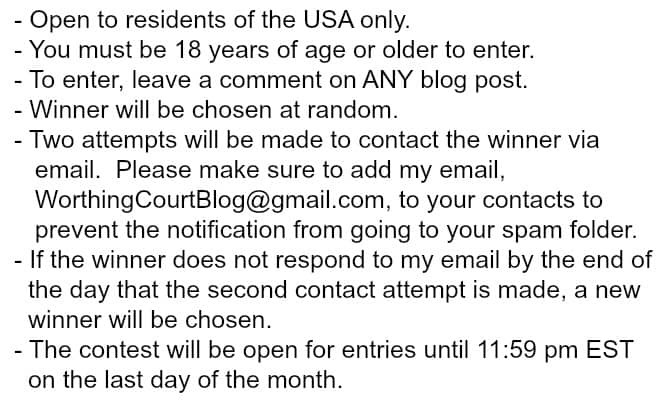 MAKE SURE YOU SCROLL TO THE BOTTOM TO READ THE CONTEST RULES. THE CONTEST WILL END ON SEPTEMBER 30 AT 11:59 PM EDT. In case you missed it, here’s a little bit of what I was up to last month. August was certainly busy and filled with projects! Click on the title to be taken directly to the post. After many months of working, I finally finished the makeover of our farmhouse style dining room. I took things slowly on purpose. I was uncertain about several decisions that needed to be made, so step-by-step it was for me. I showed you how I restyled the open shelves in my kitchen breakfast area for late summer. I’m going to be able to make just a few simple changes to get them ready for fall! Did you know that we completely gutted and remodeled our kitchen? In the first post, I shared the before’s, the during’s and after! In the second post, I talked about the good and bad decisions that we made. As we neared the middle of August, my thoughts turned toward fall! I’m all about making decorating as easy and stress free as possible, so I shared some easy to do ideas. I love their things! I love the farmhouse look a lot. The buffet looks so good. Is that an old wooden tool box? Love the kitchen remodel. I especially love the lighting and gorgeous tile back splash! I love the kitchen remodel! I find myself going back and back to your dining room. Those two chairs are to die for and are going on my wish list for Christmas. New this blog but love love it all! This is one of my go to favorites! I’m in LOVE with Magnolia Market and your blog. You have a way of simplyfying decor and make it “user Friendly” but classy! The shutters on either side of the mirror are the “bomb”. I’m new to your blog, but I really love it! As soon as I saw the fabric on the chairs, all kinds of changes to my dining room/kitchen flashed through my head…then I saw the completed dining room and fell in love! Wow! I watch Fixer Upper each week and love what Joanne does. Your blog makes my day…I so look forward all you amazing designs and tips. Keep ‘I’m coming! I love all the ideas you give us, the kitchen remodel is gorgeous and I am so ready to decorate for fall. I live in the south and the weather is still really hot so I am trying to wait for some change in the weather before I decorate. Love, absolutely LOVE your blog. It’s nice to have a chance to win something too! How sweet! You have a lovely home. I enjoyed reading about your dining room makeover. I’m fairly new to your blog and I love it, there’s so much to look at and it’s really inspiring me, especially your kitchen-it’s beautiful! The mirror flanked by the shutters is lovely. I absolutely LOVE the idea using the shutters as a focal point with the white plates. Really stands out. Great idea, will hae to try it. I like your fall table decorating tips. Gorgeous items! Love the farmhouse look! I love your gray shutters with the plates. Cute idea! Saw a pic of your dining room and now a follower. On the hunt for big check fabric. Have already ordered the rug! I really like Magnolia. And I love your house, especially the kithchen – so pretty. I’m also going to steal some of your dining room decor – those lanterns! One of my favorite blogs. Enjoyed the chairs redo. Great style! Love the neutrals and old wood. Joanna and Chip are my idols and I wish that I lived in Waco. I live their remodels. Like a few others, I love, love the buffalo check on the chairs! Your kitchen is so lovely as are the rest of the rooms…you really have a talent and an “eye” for decorating! Getting many good ideas! Thanks so much for the very generous “giveaway”!! I love all your great ideas! So happy I found your blog. We have several pieces of furniture in common. Your dining room looks quite lovely. The grey is perfect. I haven’t used grey much, but am ready to add some. Your dining room redo looks lovely! Love the buffalo check on the chairs and that whole area just looks lovely! Love how crisp and clean your kitchen looks too! I have the same indoor/outdoor runner in my laundry room- Ballard Design? It is a great product- functional and decorative! I really enjoy your posts. The dining and kitchen are beautiful. You have such creative ideas. Would love to win the gift card, working on updating my main floor. Love, love, love those chairs! Also, I like the shutters and mirror. Beautiful symmetry. I like the way you display your white and other light pieces in front of dark ones, such as the basket, a tray, shutters, etc. It really makes them much more visible! Great idea for all of us to use on the light walls in our homes! Thanks ~ and thanks for the giveaway, too! I really enjoy your blog, love Magnolia. I live in Waco and love going to Magnolia to shop. You’ve inspired me to make some changes to my decor! Thanks for your blog! everything looks so nice and so welcoming. Great Job. Love seeing your great ideas!! Your creative ideas are a blessing to me. I appreciate all you do to share with us. Thank you. So glad to have found you through Cedar Hill Farmhouse. Thanks for the inspiration. Just love the farm house look and your kitchen! Love your site so many great ideas,. I L O V E the basket arrangement for the door! Yours is my dream kitchen. I LOVE, LOVE, LOVE, the Buffalo Check fabric on the chairs. I love your blog and your give-always! Thanks for all the ideas you share. Love your use of gray hues! Sophisticated farmhouse! I have an old wooden tool box that belonged to my father and so enjoy decorating it for different seasons. Love yours! Excited about the Magnolia Market giveaway! I love the pig head with the wreath so cute !! Love your dining room makeover! Love your color choices. Great site. Thank you for sharing both, and for the terrarium idea as well. I love the wooden candlesticks. I like the basket on the door with flowers. I might even use real field posies and let them dry out for a natural effect decoration. Love the farmhouse look, especially your fabrics and the painted dinning room table and chairs. I love that program and their awesome ideas! I love that program and their awesome ideas!! Love the painted pumpkin, where are the directions ??? I love the two armchairs, they are very inviting. I’m still searching for a buffet, yours is very pretty. Great ideas and photos! Thanks for the giveaway! everything is beautiful! love all the decor changes and changes you’ve made in your home! I always love your tablescapes,and you have out done your self for fall! Suzy, I just love your inspiring decorating! Everything is so elegant, yet welcoming! Especially like your decorating tips. perfect for the fall. Our sheep has rusty red color & cream fleece. Your home is lovely. I love the plates mounted on the shutters – very creative! Ooooo…thanks for the chance to win such a nice prize!! Thanks for the recap. I’ve been checking back when I have extra time to see more on your office makeover, too. Love the cage wire inserts. I have always wanted to do that to some of my kitchen cabinets. I really enjoy your blog. Nice job on you dinning room make over. Love the large print check fabric on the chairs. Thanks for sharing you transformation ! Thank you for running a contest, nice was to pay-it-forward. Especially loving the Magnolia gift card… such a great prize!! I love the flower basket on your door. Any idea where I can find that type of basket? Hi Trudy. The basket for the flowers on my door is from World Market. I downloaded all of your kitchen photos! Thank you for the inspiration! Good morning, Suzy. I am planning to duplicate (steal!) your basket of sunflowers door for my front door. Love that. and love your home decorating with really clean lines. I enjoy receiving your daily blog. Love your blog! So many great ideas. Sunflowers in the basket on your front door are so pretty! 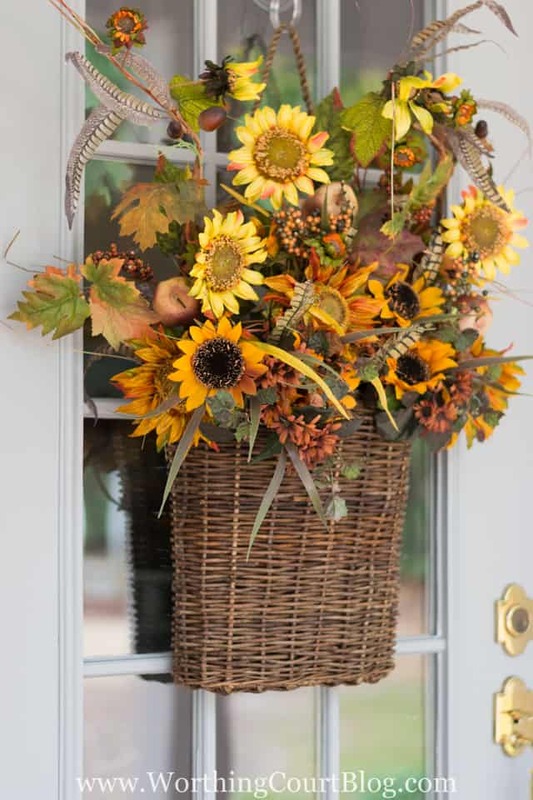 The fall basket on the door is beautiful…just wish it was on my door! I just love all of your designs, especially the family room makeover. You are very creative and thank you for sharing with me. Gosh how did we all decorate our homes before the internet? Oh yah lots and lots of magazine subscriptions LOLOLOL ! Love your style! Love your kitchen! Now that you have lived in your home for awhile now, is there anything you would have done differently? I’m trying to convince my husband that our next home should be painted all neutrals and then I can add the “color” in the art, pillows, curtains, etc. I am now living and still loving my red dining room and kitchen but will eventually have to paint it when we go to sell. Oh well, live and learn. I love the kitchen ! and everything else looks great the shutters next to the mirror look great ! Love your fall porch ideas……absolutely lovely!! Your home is beautiful and I love your recent dining room update!!! Love all your decorating ideas, you give me a lot of inspiration!! Thanks for offering this gift card drawing again! Fall is such a wonderful time to decorate and I’ve enjoyed all your inspiring posts! Great job. every thing looks so clean and fresh. I love the basket on the front door. I adore the farmhouse look. Reminds me of Summer’s at my granddaddy’s farm in GA. Your home is beautiful and I so enjoy your blog. Thanks so much. Love your blog and decorating style. I get lots of ideas from you! I’m new to Worthington Court and can’t wait to read my daily email every day! Your site is filled with so many great ideas. I’m constantly inspired!!! What a fun Party and amazing giveaway!! Thanks. Farm style is one of my favorite styles!!! I love all the changes you have made in your new home! I love your blog and my favorite makeover show is Fixer Upper. You have wonderful ideas that spark my creativity. Ordinary old items become points of interest and conversation. Just l love your blog and I look forward to your new post. Thanks so much! Love your blog & all the beautiful things you layer in your decorating. 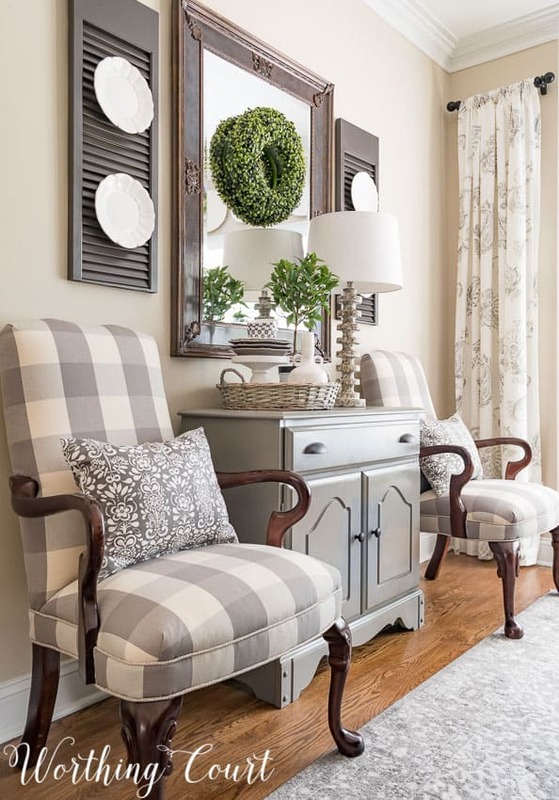 Buffalo check upholstery on chairs – very crisp look – neutral tones are delightful! I love your decorating style. Thanks for all the inspiration! Just love the dining room redo. Especially how there really isn’t anything fancy in the way of furniture….just the colors you painted things and the way you arranged the decor but it comes together so beautifully! I love , love all your ideas. Such inspiration. These have such beautiful things I would so love to win this one thanks for the chance. Planning a remodel of my country home and I was so indecisive in which décor I should go with. Thank you for helping me find my “Style”! I love the gray tone carpet you chose for the dining room! Do you have any other choices for rugs? Hi Linda. The best place that I’ve found to shop for rugs online is RugsUSA.com. You can search by color, size, style, etc. I love your blog! Your decorating style is soooo me! Love all the fall ideas, but it’s hard to get motivated when it is 96 in south Texas. I am so in love with your dining room that I decided to try to duplicate it…well, sort of!! I sprayed my dining chairs the Anodized Bronze, they have cane backs, and wow, they look marvelous. Now I’m deciding on how to attrack my table. I can’t thank you enough for the inspiration you’ve given me….my beach house is now going to be rockin’ the gray!!!! I Love your blog! We are moving into a new home and you have given me so many great ideas. The 2 things I know I am going to borrow from you is 1.The use of twig wreaths everywhere, and 2. the shutter decoration that you designed. Instead of the shutters though, I have 2 very old stained glass windows from my husband’s grandmothers’ Texas home. I am going to use those the same way you used the shutters. Thank you for you many great ideas….Keep them coming!! Just love your dining room and your choice of colors. The textures really enhance these colors. Thanks for all the great decorating ideas you have given me. Keep them coming! I love the Magnolia rug line. I am in need of a new rug for my kitchen dining area. Thank you for a great opportunity to win! Glad I found your blog! I love seeing your ideas. I love your dining room buffet. The green apples are such a nice autumn touch! Your dining room is so pretty. I love your elegant country style. I actually went to the Magnolia store several months ago! I saw so many thing to love but didn’t get, that gift card would be smokin’! Thanks for the opportunity. I love your blog! Thank you for sharing your great decorating ideas. I love your decorating style … very inspirational! Your home is fabulous, love everything about it. A chance to win something is always a fun opportunity! Thanks! I like the welcoming feel of your home and your ideas. I like what you did with your dining room furniture, especially the gray plaid chair covers. They look exceptional. You can really feel the change of the seasons in your decorating style. I feel the crispness in the air and the hot coffee on the porches. I along with so many Love the farmhouse look. (Thanks to JoJo & Chip). Thanks for sharing all your great ideas. Love’em all.!!! Love your website I am going to make a banner this week thank for that idea of reverseable one!! Really want to win the Magnolia Giveaway!! 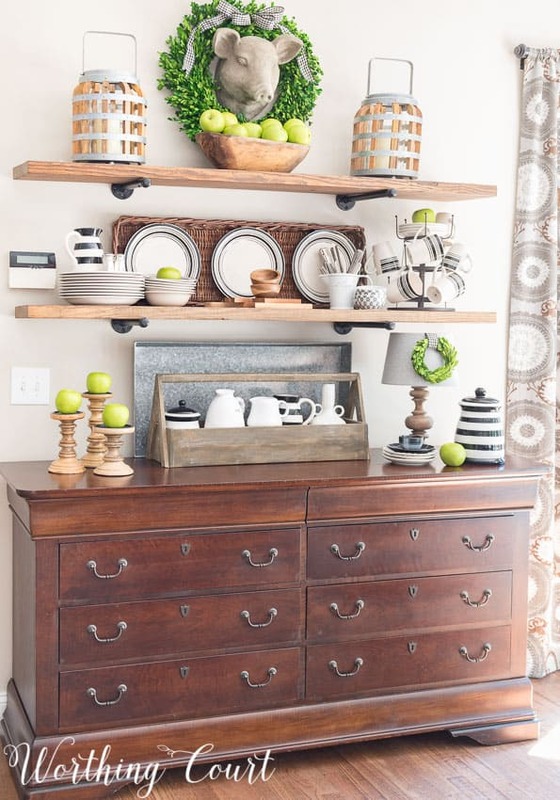 Also love the open shelves that you did, and will be trying that myself in my dining room! Suzy, your blog is the best! So far I love it all! Love the dining room makeover! So want to redo mine. Love the gray desk as well! Love it all! I love the seasonal decor. Thanks for a very enjoyable blog. Provides me lots of inspiration daily!! I love the calmness of your office. It’s beautiful. Just a stunning transformation of the dining room Suzy. You’ve given me so many ideas and so much inspiration for our new farmhouse that we are building, thank you so much. You are a pleasure to follow. Love, love, LOVE your primitive shelf above the sideboard and of course your hanging lanterns, but your new upholstered chairs really hits it out of the park! Well done, your dining room is beautiful. Love how your office looks! Love a lot of your ideas. Especially seemingly small design ideas such as your rustically simple shelves in your breakfast room. I may be copying them. I so enjoy your blog! You continually give me ideas! 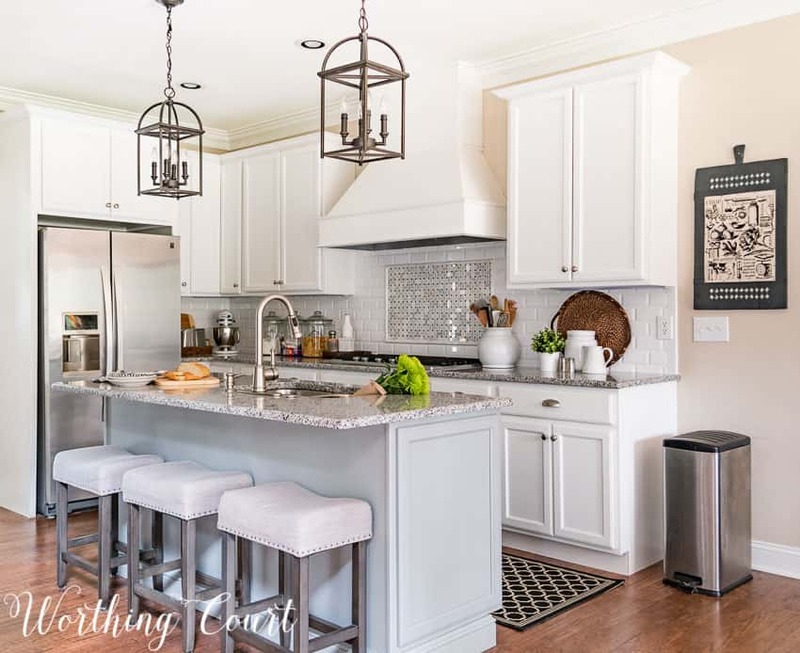 Love your gray and white kitchen – very pretty! I so enjoy your blog and your home is lovely. Keep it up. I love your blog. You seem so personable as if you are speaking to each of us. You have a knack in all the rooms you makeover. So many projects. Wish we had a Pottery Barn outlet in St. Louis. They can be pricey! I feel a bond………my middle daughter is a Susie, just different spelling! My husband and I are almost through remodeling our 42 yr old kitchen. He is a retired contractor who will soon be 70. He has saved us money by “slowly” doing much of the work, but that is how you work at our age. I love your blog! All the decor items are so tasteful and inspiring! Also love Thrive Market. Wow, Suzy! I love the front door Fall leaves arrangement! Thank you for all of the wonderful ideas you share with us! Thank you, too for a chance at the give-away! Love all the gray you have used in your home. Gray is a great “neutral” and coordinates with so many other colors. I love your decorating ideas. Beautiful home! Love the buffet decor-great inspiration! Love your blog, Suzy…I have “borrowed” some of your ideas from your beautiful home……Thanks for all the inspiration you give me in decorating my home on an affordable budget ! Love your dining room. Wish you could come to my home and make suggestions. Since that is not possible I will continue to try to incorporate some of your ideas into my home decor. Thank you for your willingness to share. love farmhouse style!!! and i very much enjoy your blog and pictures! I LOVE the door basket with the sunflowers and feathers. Such a striking look! I need to incorporate some buffalo check into my décor! I love it!! Forward to more of your posts. Love the office, it is so relaxing. I always love what you do, everything you do, the special touches all make a beautiful room.